Dedicated to breeding short and longhaired Burmillas in black and brown shaded or tipped silvers. Kittens lovingly raised in my home to be well socialized. Pet kittens are sold desexed, vaccinated and microchipped. Striving to breed the ideal Burmilla with an approved Burmilla Breeding Program. We adore our Manx & Cymric kittens and cats and have been breeding hem for 6 years. All are raised in our home and are socialised to fit into any home. Manx are the cats who think they are dogs. Very loyal and loving. All come fully vaccinated, microchipped, desexed and pedigree papers. Once you own a anx no other cat will do. Breeder of quality Devon Rex cats for show, breeding and loving family pets. I am more than happy for you to phone or email me so I can share my passion for Devons with you. Then a DEVON is for you! Nestled in rural bushlands on Gympie’s outskirts all our kittens are bred for personality, health and are of outstanding quality. All babies are born and reared inside in a family situation and ready for adoption. Find us on Facebook - Trudy Bale. Definately different a Devon Rex is a cat that is unique. 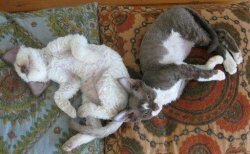 Short curly coats make the Devon Rex low maintenance and low allergy. They are fun to own being both playful and intelligent. No home is complete without one. Contact Jill for availability of kittens. They come in most colours and all have personality plus. Jandindi is situation in the south-east countryside of Fernvale, just 17 klms from Ipswich. 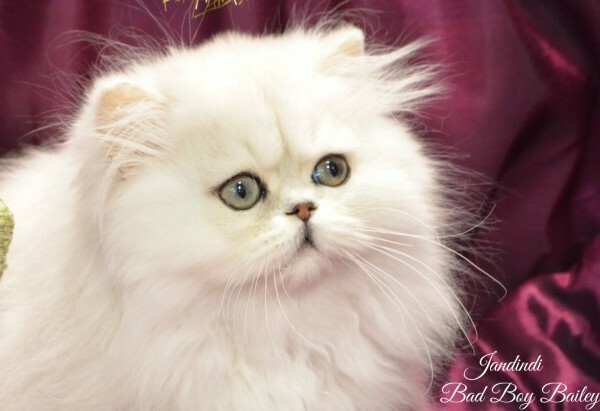 Breeder of the beautiful chinchilla, shaded silver and golden shaded Persian and exotic cats with green coloured eyes with the distinctive black eye liner rim. My kittens are raised in the house so that the transitions to a new home will to upset the new kittens. They are toilet trained, vaccinated, microchipped and desexed before joining their new loving forever homes. We are situated in the Tamborine Village area. We breed bi-colour and solid Persians and Exotics also Chinchillas. Our kittens are born and raised in our home. They are well socialised and make perfect pets, show kittens available sometimes. Originally from the Northern Territory, we are now located in the Tweed Valley close to the Gold Coast Airport and have been breeding Korats since 1991. Raised with love and sold with regret, our kittens are housed reared, handled frequently from birth with health and sound temperament our priority. Visitors are most welcome by appointment. Active, intelligent and very loving, the curly coated LaPerm will steal your heart. They love to follow you about and hop on your knee when you sit down. Their semi longhair coats are low shedding, don’t mat or require any grooming. They come in any colour possible in a cat, including the new pattern karpati from Eastern Europe, which is exclusively at Frisson Cattery in Australia. Please see our website for more information and details of available cats and kittens of this rare breed, or our facebook page, Frisson Cats.